General MacArther was one of the heroes of World War II, specifically in the Pacific theater of operations. This quote may not be the most famous, but it is certainly true. If you want people to be motivated and inspired, to follow you with enthusiasm you have to start with WHY (A point Simon Sinek elaborated on in his book Start with Why, affiliate link). Otherwise, people will do what is right for them, and loyalty will not even be a consideration. Whether leading men on the battlefield, or in a difficult project, or a small business, the WHY is what keeps the team together and focused. For many people, work is just a paycheck, and a better opportunity will "inspire" people to leave. And yet, many people will leave a solid job with a good paycheck to work long grueling hours at a startup for little money; because they believe in the WHY. 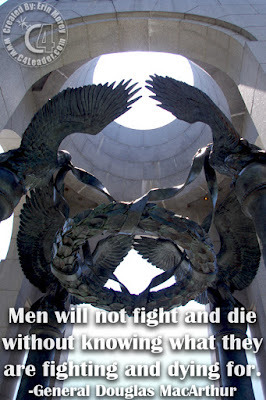 This picture is from the WWII memorial in Washington DC, the Eagles representing the United States, and the Olive Wreath supported by them a symbol of victory dating back to Ancient Greece. A fitting tribute to the veterans of WWII.